I’ve been traveling most of the past month, to places as far away as medieval Spain or as close as the contemporary music scene in Ojai. It’s hard to get Santa Monica out of one’s mind, however. I left town the day Expo opened, but I was reminded of it, and certain controversies involving it, when in Spain I kept seeing trains in the middle of streets and plazas. 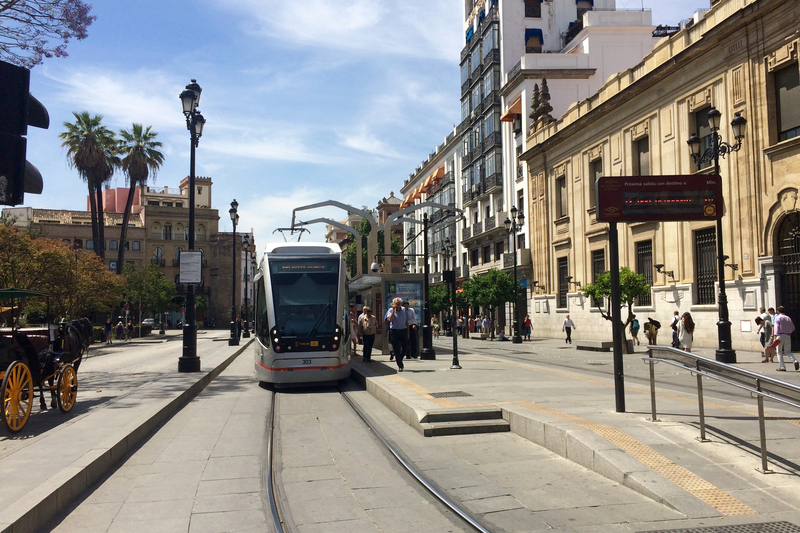 Here’s a picture of the tram stop that’s in front of Seville’s cathedral — evidently Spanish people don’t need fences to keep them from walking in front of trains. I can’t imagine that they are that much smarter than we are. LUVE will get the attention tonight, but there is another potential ballot measure on the council agenda that should not be ignored. It’s a proposal to amend the Oaks Initiative. Readers will remember that last year City Council hired the attorney John Hueston to investigate, along with the Elizabeth Riel/Pam O’Connor case, how the Oaks Initiative was enforced (or not enforced) in Santa Monica. Oaks, passed in 2000, prohibits city officials, including council members, from receiving benefits, including campaign contributions, from parties who have received benefits voted for or conferred by the official. City Attorney Marsha Moutrie had refrained from having her office enforce the law because of her concerns about conflicts of interest she and the office would have. Hueston, in the aftermath of his investigation, made various recommendations concerning Oaks, some of which make sense. He pointed out that the Criminal Division of the City Attorney’s office was “walled off” enough from advising city officials to be able to investigate Oaks complaints without having conflicts of interest, and he had various ideas about cleaning up ambiguous language in Oaks. When Hueston proposed this at the council meeting when he presented his report, he was questioned by Council Member Gleam Davis about how this could be enforced when it was unclear how city officials such as council members (who are not involved in processing applications) could know when the no-benefit period would start. Hueston’s answer was to say that that was the idea, that as former prosecutor he liked it when rules were fuzzy, because that gave prosecutors more flexibility. Wow. There’s no rule of law when laws are vague. As for the purpose of Oaks, this change would do nothing except shift more campaign spending into independent campaigns, known elsewhere as PACs, and make our politics less transparent, not more. Speaking as a former candidate, the limits on campaign financing that we have in Santa Monica, including Oaks, have not made our politics more pure. Running for office is expensive in Santa Monica since it’s hard to reach voters other than by mail, and with campaign finance limits, it is virtually impossible for a candidate to raise enough money to run for city council in Santa Monica. When candidates can raise money to run their own campaigns, they not only can control their message, but they are also responsible for that message and can be held to account for the sources of their funding. When candidates can’t raise money, candidates with their own money to spend (and when I ran I was in that category) have an advantage. Instead of individual campaigns controlled by candidates, Santa Monica’s politics revolve around independent expenditure campaigns, which include Santa Monicans for Renters Rights (SMRR) and other, smaller groupings of residents, unions, and business-funded campaigns. Anyone can contribute unlimited amounts to these campaigns, regardless of Oaks or any other campaign finance laws, and these campaigns choose their own slates, often linking candidates who are otherwise not likely to be linked. Hueston’s proposed change to Oaks would make things worse. Please note: before the City Council’s meeting tonight (i.e., at 5:30), there will be a community vigil in front of City Hall to be held in the aftermath of the Orlando attack. This entry was posted in Uncategorized by Frank Gruber. Bookmark the permalink.